Normally, faulty wheel cylinders aredetected when fluid leaks appear or the pistons stick in the cylinders, preventing brake application. Many shops service the wheel cylinders anytime the brake linings are replaced. NCF units require replacement of faulty wheel cylinders. Rebuilding of wheel cylinders is NOT authorized. To rebuild a wheel cylinder, remove the boots, the pistons, the cups, and the springs. Most wheel cylinders can be disassembled and rebuilt on the vehicle. However, many manufacturers recommend that the wheel cylinder be removed from the backing plate and serviced on the bench. This makes it easier too properly clean, inspect, and reassemble. A rebuild normally involves honing the cylinder and replacing the cups and boots. It is important that the cylinder be in good condition. Inspect the cylinder bore for signs of pitting, scoring, or scratching. Any sign of pitting, scoring, or scratching requires cylinder replacement. 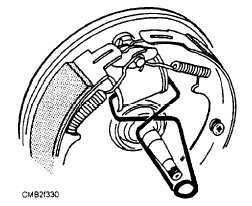 A brake cylinder hone is used when honing is required. With the cylinder hone attached to an electric drill, lubricate the hone with brake fluid and insert into the cylinder. Turn the drill on and move the hone back and forth one time ONLY. The cylinder bore must not be honed more than 0.003 inch larger than the original diameter. Replace the cylinder if the scoring cannot be cleaned out or if the clearance between the bore and pistons is excessive. When honing a wheel cylinder, do not let the hone pull out of the cylinder. The spinning hone can fly apart causing bodily harm. Wear eye protection. After honing, clean the cylinder thoroughly using clean rags and recommended brake fluid. Make sure the cylinder is clean and in perfect condition before reassembly. The slightest bit of grit or roughness can cause cup leakage. When reassembling the wheel cylinder, make sure the new wheel cylinder cups are the same size as the originals. Cup size is normally printed on the face of the cup. Lubricate all parts with clean brake fluid and reassemble. Never allow any grease or oil to contact the rubber parts or other internal components. Grease or oil will cause the rubber parts to swell. which will lead to brake failure. To replace the brake shoes, first remove the wheel and brake drum. With the drum removed, note how the springs and retainers are installed before attempting to remove the shoes from the backing plate. This will assist you during reassembly. Figure 7-29. - Wheel cylinder clamp in use. Figure 7-30. 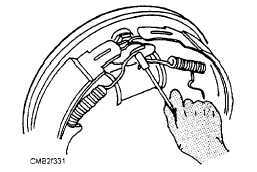 - Removal of the brake return springs.